According to Rolling Stone, Kiss announced during n appearance on America’s Got Talent last night that the band would soon be embarking on one last tour before wiping off the makeup and hanging up the spiky armor for good. Kiss said this will be “the most explosive, biggest show” they’ve ever done, and that both fans and newbies alike should all come see the big explosions. Specific dates haven’t been announced, but the Kiss website promises more details will be coming “soon” with a dramatic, fiery splash landing page. If this seems like something Kiss has done before, that’s because this is definitely something Kiss has done before. As Rolling Stone points out, the original Kiss lineup—Gene Simmons, Paul Stanley, Ace Frehley, and Peter Criss—went out on a final tour in 2000, but the band went back on the road just a few years later. 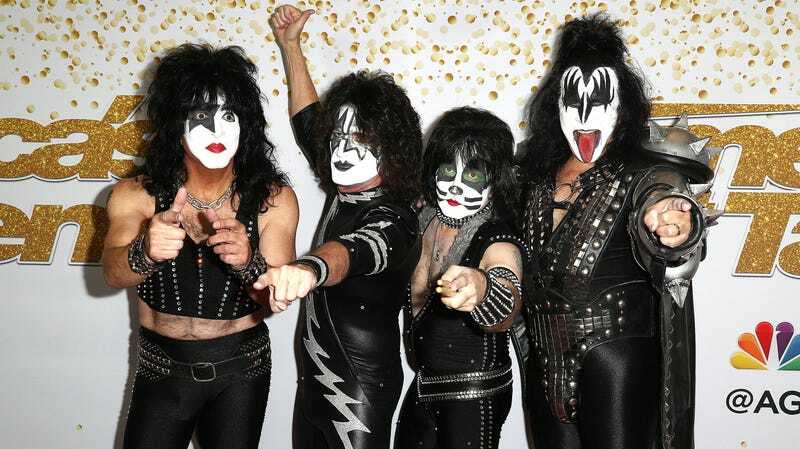 Kiss reunited in 2014 at the Rock And Roll Hall Of Fame induction ceremony, but Simmons and Stanley are the only original members still in the group.